Aimee Lee first came to know "hanji" at a Chinese art history class at Oberlin College in the United States when a museum curator said Chinese painters preferred using traditional Korean handmade paper. The Korean-American artist and papermaker found the Korean paper was relatively unnoticed in the same way Korea remains relatively unknown compared to Japan and China. "It was overshadowed by its counterparts in Japan and China," Lee told The Korea Times. She then began her research on "hanji" and knew she wanted to devote her career to this. "Washi" or Japanese paper did not gain its international recognition overnight. For "hanji," many years of scholarship, publishing, marketing, and education were essential to change the way people valued the handmade paper, she said. This high-quality paper is made from the inner bark of the "dak" (mulberry) tree. Making "hanji" is complicated and labor-intensive and similar to that of Japanese paper but different in sheet formation techniques, forming laminated sheets and calendaring or "dochim," a method of pounding finished sheets to compact the fibers. 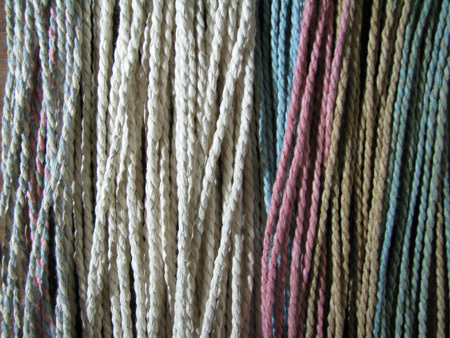 studio in North America at the Morgan Conservatory in Cleveland: dyed "hanji" cords by the artist ; and a "hanji" shoe by the artist. The paper has been widely used in recent years for modern applications such as fashion, art, design. It is noted for its durability, resilience, beauty and toughness. Spending years of research on the paper, Lee decided to learn "hanji" making from Jang Seong-woo, a Korean traditional papermaking artisan, in 2009. She has interacted with Korean traditional "hanji"masters such as Na Seo-hwan and Lee Myung-sun to make more people around the world aware of the tradition. 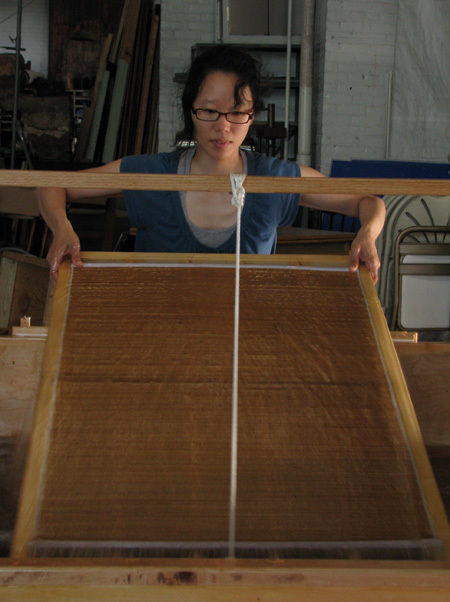 Based on her Fulbright research in Korea, she set up the Anne F. Eiben Hanji Studio, the first and only Korean papermaking studio in North America at the Morgan Conservatory in Cleveland in 2010, along with staff and volunteers. The studio is equipped with tools made by Yoo Bae-geun, registered as Intangible Cultural Property No. 31 for "hanjibal," who makes frames with bamboo and strings for making"hanji." Lee wants to share her knowledge with a wider English-speaking public. "My fear was that the traditional method of making ‘hanji' is quite endangered in Korea, so I wanted there to be a place where it could continue outside Korea," she said. The studio offers workshops every summer, and started an apprenticeship program in 2014 for more intensive training in Asian paper. Her endeavor in "hanji" goes back to 2006 when she began her research. She said only a few articles in English were available to the public ― one online, and a few in trade publications. "Although there were publications on ‘hanji' in Korean, they were not translated into English," she said. "I wanted more information, and it became clear that I would have to go to Korea directly to find it." During her research year, she published much of her findings online through a blog, YouTube videos, and newspaper interviews. When she returned to the U.S., she published the first English-language book on the subject, titled "Hanji Unfurled: One Journey into Korean Papermaking" (The Legacy Press, 2012). She also has taught students across the U.S. She said she sometimes felt her students knew about "hanji" more than before ― they had even used it in their artworks. using it for their artwork," she said. "Because the process of making paper is so difficult, there are obviously fewer people who are able and willing to make ‘hanji,' but there are many, many people excited about using ‘hanji' in their artwork who continue to do so well after they have taken classes with me." She said that one student ― a professor at a U.S. university ― ordered a "hanji" screen and mould to begin making "hanji" in his art department. Two more students there were working together to set up a "hanji" vat as well. "The key is getting the paper into people's hands and showing them what they can do with it," Lee said. "From there, the paper and technique sell themselves." She believes "hanji" can reach more people around the world but it would be dangerous to think about it as a global product to become in the capitalistic sense. "It's not something that comes off an assembly line in a factory," she said. "It's a product of nature that can only be made by people who understand environmental cycles, the idiosyncracies of the raw materials, the incredible labor of processing plants into paper, and the material poverty that comes from working in this field. I don't know any rich papermakers, and I don't know any lazy papermakers." She stressed that supporting the traditional papermakers is the first step for conserving and promoting "hanji." "Once papermakers are able to spend more time making quality paper, then it can be marketed to other audiences, the most important being teachers and paper dealers," she said. "There is no simple answer, besides hard work and patience." Because of the strength and versatility of "hanji," she feels comfortable making artwork with Korean paper and methods of transforming this paper. Not only as a papermaker but also as an artist, she has created numerous "hanji" artworks and installations through various techniques. "Joomchi" is a unique way of making textured, painted imagery on handmade paper just by using water. It takes advantage of the strength of "hanji" as well as the fact that it is made from the paper mulberry tree, which has very long fibers. "That makes it possible to crumple the paper while damp to create different textures that make the paper seem more like fabric, and it also makes it possible to fuse more than one piece of paper together without any adhesive," Lee said. 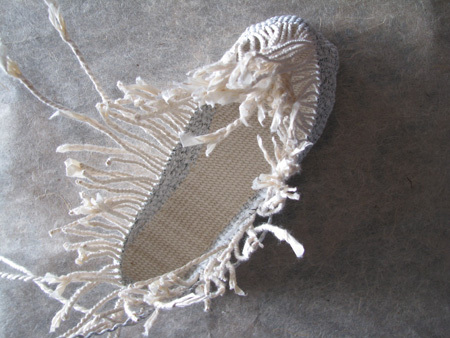 "Jiseung" is a technique in which strips of paper are twisted and plied into tight cords to weave like baskets, making it possible to handle and tug the paper without it tearing.